Ali denar le raste na drevesih? Learn about urban forests. Enter the blog competition to win a free conference package! It was the final session of the 19th European Forum on Urban Forestry in the Palatium hall of Ljubljana Castle, Slovenia. The participants were applauding while I was presenting the winners of the #EFUF2016 blog competition. Speaking on the big stage, my stomach felt a bit jittery – the sleep deprived nights that led up to the event finale and heavy coffee consumption were starting to leave an impact. A few moments earlier I presented the current on-line and social media statistics of the EFUF 2016 social media coverage. During the 5 days of the Forum, over 1000 tweets were sent and delivered over 140.000 times to almost 25.000 different Twitter accounts. Over 5000 people were reached on Facebook and 600 people were informed daily through our mailing list. The live webcast of the opening and plenary session had over 700 live views. More importantly, our contributions were seen, read and recognized by the members of urban forestry communities from all over the world. 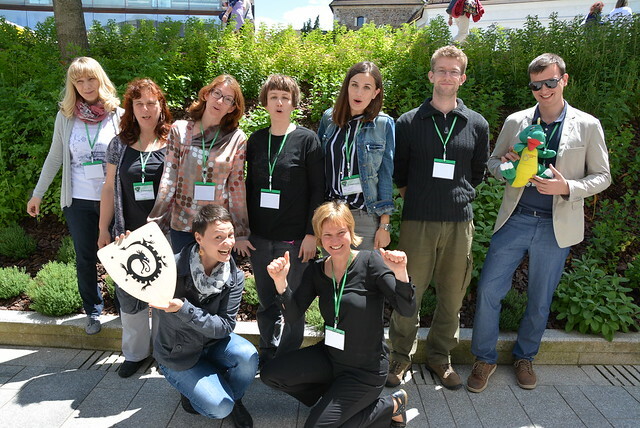 #EFUF2016 Communications Team at Ljubljana Castle (top from left to right: Natalija, Magda, Špela, Anita, Ana, Janez, Boris; bottom: Saša, Urša; missing: Liza, Luka, Andrej, Boštjan, Robert). After handing the certificate of recognition and microphone to Pieter Wieringa, author of the winning blog, I left the stage and sat down with happy and fulfilling thoughts racing through my mind. The first stop was Durban, South Africa. I remembered learning about the power and the art of social media reporting from my personal guru (although he hates to be called that), Peter Casier at the #Forests2015 Social Media Bootcamp. What an experience! Intense, draining and fulfilling at the same time. When it was over, I made a promise to myself that I will try to repeat it as soon as possible. My thoughts then shifted to early October of the same year. I remembered presenting the concept of the #EFUF2016 communication activities to Andrej (head of the organizational committee) and getting a puzzled, yet optimistic go-ahead from him. I remembered the recruitment process – persuading co-workers, presentation at the university, mass-emails, etc. It wasn’t easy because team members had to invest several hours of volunteer work per week in addition to their busy work and private schedules. In return, they were promised to learn how to use social media to their advantage. In December 2015, the team was complete and the communication strategy was prepared. I remembered the tilted heads of the more experienced team members, while they were overlooking the blueprints of our ambitious strategy for the first time. To make sure that the strategy would be properly implemented, we had weekly meetings, where we learned the art of blogging and of using different tools to disseminate the blogs and other content. We planned, executed and adjusted. When most preparations were done, we stopped meeting – the “infrastructure” was in place, the team was trained, and there were other priorities that needed addressing. May 2016, while looking like a great month retrospectively, was at moments a personal hell. In one or another role (organizer, speaker, lecturer …), I took part in 3-4 communication and dissemination activities of our Slovenian Forestry Institute and the project I manage (LIFEGENMON) per week. Not being a total extrovert and sometimes still learning on the job, such an amount of organization, management and public speaking was very difficult to handle. The members of our team mostly come from our Institute, and while their enthusiasm and work ethic could never be questioned, the team spirit started to slowly dissipate in the second half of the month because of the (too) demanding workload. Then came the last week of May 2016 – the week of the EFUF. We were all working on fumes then and I wasn’t sure about how the communications team would work in action. We met extensively on Monday and Tuesday, created a detailed plan with roles for each team member and did the final tweaks of the online infrastructure. Some of the points on our to-do list had to be abandoned because of lack of time. On Tuesday evening, after the preparations were complete (and all of the twitterfall screens set up :)), I was still uneasy and had my doubts, but I was confident that we did all that we could to prepare for the Forum. … and then my name was called. I wasn’t expecting to be called on stage again, but it started to light upon me just a little bit before it happened – when the words “communication” and “dissemination” were spoken. Cecil Konijnendijk van den Bosch and Clive Davies were presenting the Young European Urban Forester of the Year 2016 Award and I was selected as the runner-up. The path to the stage was blurry, and luckily I wasn’t offered to give a speech. Everybody was clapping and people were offering to shake my hand and patting me on the back but I couldn’t really respond because I was so shocked and confused. One could argue that being a runner-up for such an award isn’t a big deal, and one could agree. But to me it really means a lot, not because of the diploma, but because of all of the sincere congratulations I’ve received and the recognition of the hard work the #EFUF2016 Communications team put in, often at the expense of their personal and family time. This blog is a part of the communication activities of the European Forum on Urban Forestry 2016, which is going to take place from May 31 to June 4 in Ljubljana and Celje, Slovenia. Find out more or Register here! Click to sign up to receive news and updates about and from EFUF2016! European Young Urban Forester 2016 comes from Germany!